Today, Casio G-SHOCK unveils the latest addition to its luxury MR-G line up of men's watches, with the release of the MRGG2000GA-1A, which is currently on display at Baselworld. Each limited-edition timepiece is hand engraved using the classic Japanese technique, "yasuri-me," an intricate process that entails each of the band's center links with a rasp finish similar to that done on the tang of a sword. The band is complemented by a deep violet color and recrystallized Arc Ion Plating (AIP) on the case, and the bezel boasts an upscale, mirror-like finish. The special edition MR-G watch will be on display at Baselworld from March 21-26 at the Casio booth, located in Hall 1.1 B71 & 67. The MRGG200GA-1A features a Cobarion® bezel with a flawless mirror-finish, and a scratch-resistant sapphire crystal with non-reflective coating, elevating its overall clarity and brilliance. 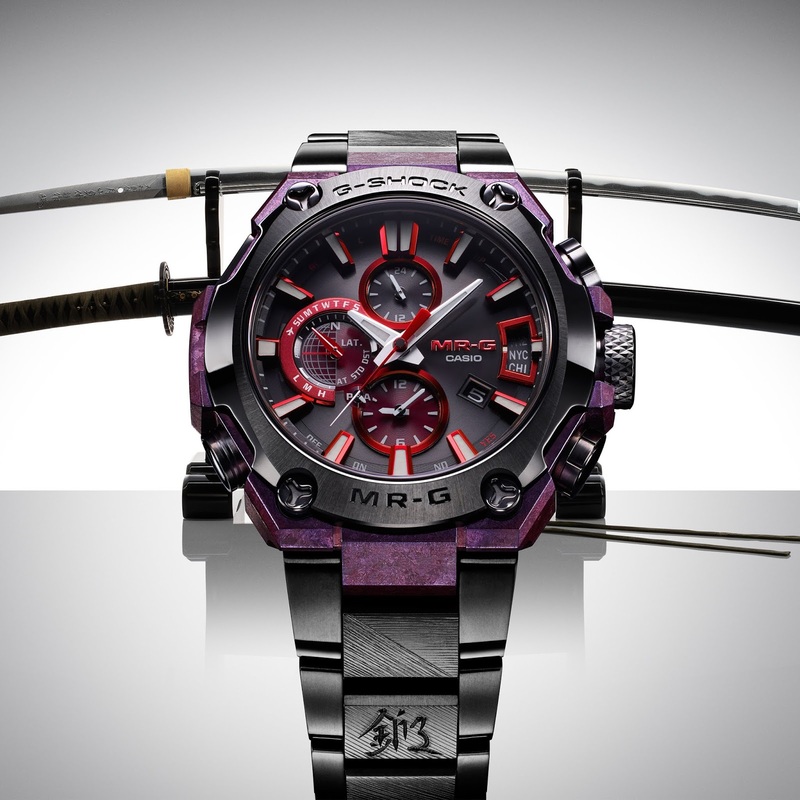 The watch's face also boasts a watered pattern and a unique bladed edge to symbolize a Japanese sword, while the band is hand engraved by historic Japanese artisan Sadanobu Gassan, whose heritage dates back to the 12th century. The new model also comes equipped with G-SHOCK's top-of-the-line technical capabilities including Multi-Band 6 technology for three-way time sync to allows for accurate time keeping, as well as Tough Solar technology that provides self-charging capabilities. The watch also has Bluetooth technology to connect with the MR-G Connected smartphone app, which allows for self-adjusting time changes as one travels between time zones in addition to tracking solar charge, checking signal reception frequency and more. The MRGG2000GA-1A will retail for $7,400 and will be available for purchase at very select G-SHOCK authorized retailers and G-SHOCK Soho store beginning in July.